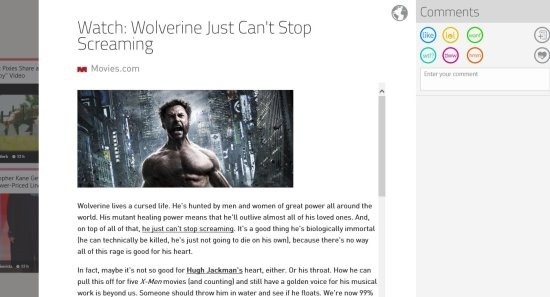 Rockmelt is a free Windows 8 news app that keeps you updated with the latest news from the internet, and blogs of your interests. 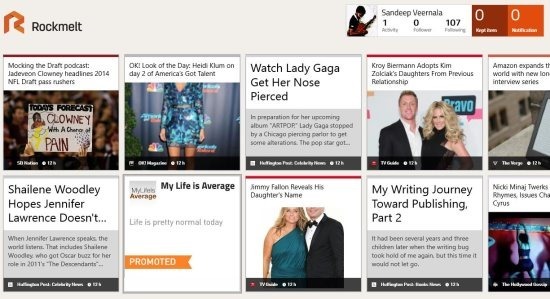 Rockmelt brings you news from various sources, making it an all in one app for news and updates. Choose your favorite topics on which you would like to get updates and the app will get them for you. Make better use of internet through Rockmelt! 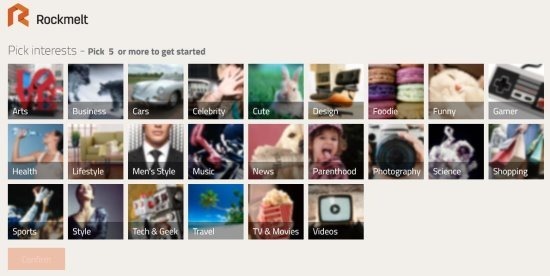 Rockmelt app can be found in the News & Weather category of Windows Store. Once you are finished installing the app, launch it and you will see the screen as shown above. 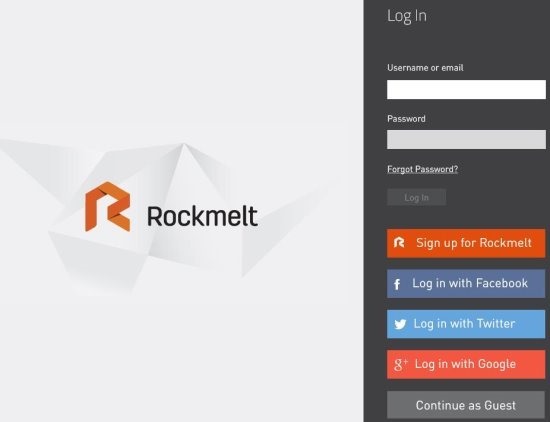 Sign Up for Rockmelt, Login with Facebook, Twitter, or Google, or simply continue as Guest. Once you are done, you will be asked to choose from various interests: arts, business, cars, celebrity, cute, design, foodie, funny, gamer, health, lifestyle, men’s style, music, news, parenthood, photography, science, shopping, sports, style, tech & geek, travel, TV & movies, and videos. Choose 5 or more interests and then click Confirm. Now you can see that the homepage of the app is filled with news of your interests. Just scroll through them and if new updates are waiting, the app will indicate you. You can opt for extra interests by right clicking on home page and then choosing desired interests. You can also deselect previously chosen interests from here. Click on the news that you would like to read and then it opens up in a new page (like shown below). You can scroll down for the full news. The right side of the app is for commenting on the news with: Like, Want, Aww, WTF, LOL, and Hmm, or else post your own comments in the space provided. You can also mark the news or website as favorite by clicking on the icons on the extreme left. To go back from this page, just click on the empty space on the left. 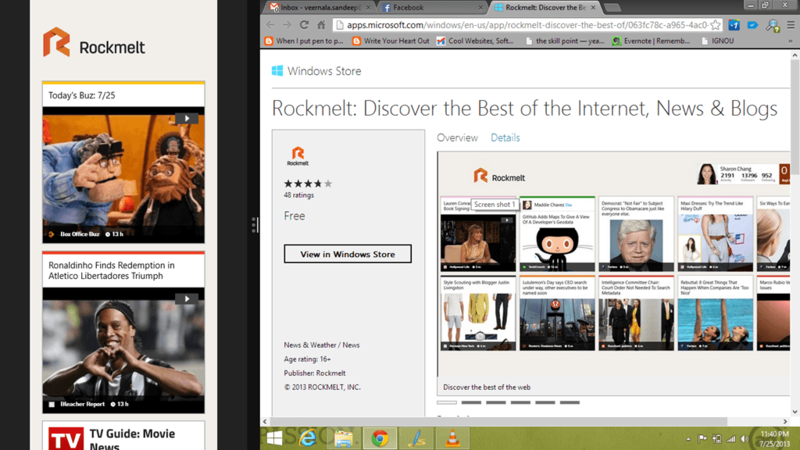 Rockmelt is a free Windows 8 news app. Rockmelt keeps you updated with latest news. This app shows news only from the choice of your interests. Use instant comment buttons to comment or just comment normally. Read news and watch videos also in this app. Snap mode also available in this app. Click upon this link and then view the app in Windows Store App. From there install and start using this news app on your Windows 8 PC to make efficient use of internet using single app. Also try: Discovery Channel App for Windows 8 or Windows 8 Education App.